A versatile camping companion that is easy to pack and carry. Constructed from quality tempered steel with a rubber grip. 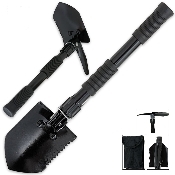 Offers the versatility of a shovel with the handy option of a dibble pick. Folds to a convenient size and fits neatly into the nylon carrying pouch (included). 16 1/8" overall.